I’ve always taken my uncle-ing responsibilities seriously. Even before my little nephew was born, this much was clear to me: growing up, I didn’t have an elder male figure I could depend on to bail me out of trouble, or even to show me the ropes to basic adult stuff like shaving in a hurry or sleeping with women without falling in love with them, and that sort of deprival lasts a lifetime. I would not let my nephew grow up a fuzzy-chinned romantic fool. My approach to uncle-ing my little niece, however, is a little different. Having played easily manipulated filler middle sibling to the estrogen sandwich with extra cheese (and evil) that was my two sisters all through my blunder years, I was trained early on to be terrified of all women under legal drinking age. It doesn’t help that my niece is the spitting image of her mother at the same age. What little niece wants, little niece gets. Having said that, I’m quite fond of this gig I have going as the niblings’ only maternal uncle, and the unofficial “fun uncle”. As my sis never tires of pointing out, mine is a kingdom founded entirely on the great institution of the uncle-in-transit. I’ve never lived in the same city, or even the same state as the niblings until I recently moved to Cochin, so I’ve never had to unplug the Xbox just as the nephew was approaching his top score or take a U-turn and head right back into the city after a long day at work because I forgot to pick up glitter pens for the niece’s ‘art’ project. I come bearing gifts, and when I’m visiting, no household item can not be converted into a plaything. So when my sister recently announced that she, along with her husband, would be out of town for a night, I jumped at the chance to rewrite a little history. Not only would the fun never set in the empire of the Fun Uncle, but the subjects would also eat their five greens with relish, shower without complaint, and scoot off to bed in orderly fashion at a quarter to ten. It was only a matter of a few hours before I would be inducted into the pantheon of all time greats, right up there alongside Uncles Bun, Charlie and, err, Kracker. The first evening, a Sunday, passed by harmlessly enough. I reached their place at around five with a party-planner’s diary worth of things to do, only to find that the agenda had not just been set, but that it was cast in stone: a trip to Donut Factory followed by a visit to Crossword bookstore, both conveniently located across the road from one another in Panampilly Nagar, where they live. Fair enough, I thought, especially since my own game plan would have taken us on a criss-cross road trip across the heart and whatever soul is left of commerce-heavy Cochin. The outdoor seating arrangement at Donut Factory did however tear a significant hole in my comfort zone. 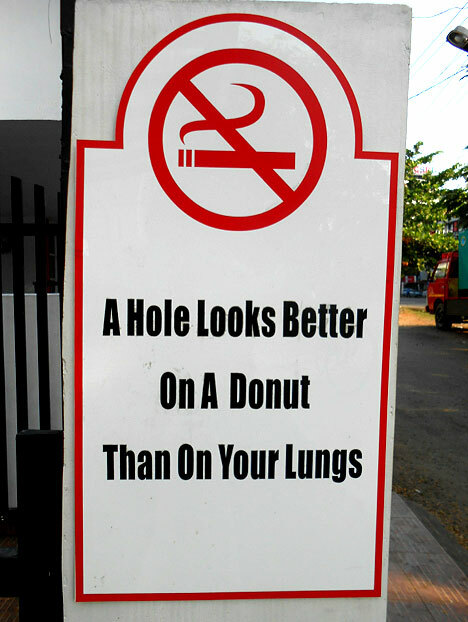 My nephew, who takes great pleasure in reading out—and consequently inquiring as to the meaning of—just about any road/shop/other sign he can find, pointed a questioning finger at the poster behind us: “A hole looks better on a donut than on your lungs”. The words were accompanied by a picture of the universal circle around a cigarette with a line running across it. “It means you shouldn’t smoke,” I said, “because smoking pokes holes in your chest.” “But shouldn’t that be your choice?” he asked immediately, with all the privileged disdain for authority of his particular breed of Cochin’s private school populace. My niece plays games of a subtler kind. At Crossword bookstore a little later, after explaining to me the literary merits of the many numerous diaries maintained by a kid who describes himself as “wimpy” with a sense of irony I suspected was lost on her, she asked me: “So how much can I spend?” I quickly scanned the price tags on the shelf in front of me, and said: “You can both pick up a book each.” “No,” she declared, “tell me how much we can spend, that’s what we always do.” As I tried to remember if I even understood the concept of spending power at her age, she added, “Our other uncle always lets us spend five hundred each.” I nodded in the affirmative, and prayed to all the Gods I’d heard of that she wouldn’t grow up to be a politician or a banker. The kid was half-naked and asleep on his feet as a middle-aged woman spoon-fed him breakfast, as the streets of some ghetto or the other rose up in flames on the T.V. screen to electronic punk rock. Of course the real test came the morning after. My niece woke me up at six a.m. to make her a poster for her campaign; she was running for Class Monitor and her pitch was “I will increase lunch hour by one hour”. “More glitter, dude,” she sighed exasperatedly every time she walked past in various stages of undress until the maid finally scooped her up and stationed her under the shower. I think she actually flicked my ear one time, but that may also have been my brain exploding. Only when the early morning wind did a little jig around my face as she waved goodbye from her bus did I fully realise the absurdity of the Goldingesque nightmare I had woken up to. My nephew had courteously decided to exit his royal chambers when I returned, at least physically if not in spirit. I walked in on the sight of the maid flying spoon-aeroplanes of sliced idlis into his open mouth as he stood in front of the television, his hand operating the video game console out of sheer muscular memory even as his head drooped to one side, his eyes tighter shut than Kerala’s shops on a hartal. The kid was half-naked and asleep on his feet as a middle-aged woman spoon-fed him breakfast, as the streets of some ghetto or the other rose up in flames on the T.V. screen to electronic punk rock. The world hadn’t witnessed such decadence since the Romans. Tharun is a serial immigrant, pop culture aficionado, and recovering Malayalee. His first novel Cough Syrup Surrealism was released in May 2013 by Fingerprint Publishing. Twitter: @icyhighs. By Insertpen Namehere · I’ll say it again: Drag Queen Cabaret Bar. Sizzle! By Neha Chaudhary-Kamdar · Gandu's quest won’t bring tears to your eyes or that warm feeling in your heart. But you will also not be able to take your eyes off it. Tonight, We Dine in Hell! By Solo · 300 is about harsh realities, going far away from home, and never coming back.